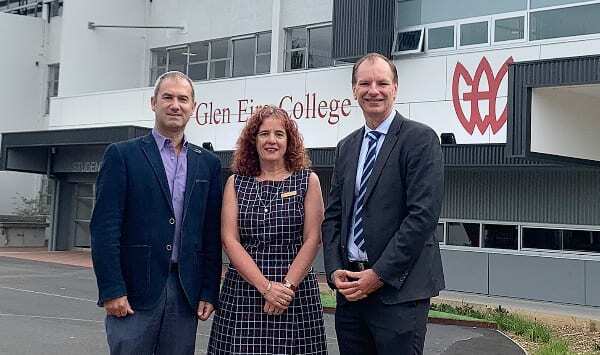 The United Jewish Education Board (UJEB) and Glen Eira College (GEC) have announced that the teaching of Hebrew will resume at GEC in 2020. Itzik Sztokman, UJEB Executive Principal, Sheereen Kindler, Glen Eira College Principal and David Southwick MP, Member for Caulfield. GEC has been the only Victorian Government school offering Hebrew language studies within the curriculum since 2012 but their decision to stop teaching Hebrew in 2019 led to great community angst. The school principal and president said they had to cut the subject due to staffing issues. The campaign by school parent Jonny Schauder to see Hebrew return to the College has clearly been successful in causing a rethink. Member for Caulfield, David Southwick, is also supportive. “With a growing number of Jewish students attending Glen Eira College, it’s important to develop a strong Hebrew program to provide real choice for our students at public schools … UJEB’s role going forward will ensure our community will have a quality program, that will complement other cultural activities at the school, to help students flourish,” he said. To ensure that current GEC students don’t miss out, UJEB is commencing a new after-school program covering Israeli language and culture in term 2, 2019. This will include basic Hebrew and popular teenage topics such as food and music. It will complement the longstanding weekly J-Lunch sessions at the school. GEC will be running a Languages Open Day on 30 April and an Open Night on 1 May 2019. UJEB Principal Itzik Sztokman will be on hand at both of these events to talk with parents. Finding a teacher(s) is the issue.